>>> and with such fierce competition for jobs these days, there are a couple of sectors hiring and even growing. science and technology , that as we've seen in our education nation series this week, american students are far behind their global competition in science and math. there is a push to reverse the trend and it starts by training future math and science teachers. our report from our education correspondent, rehema ellis. >> reporter: sherry lamb is studying science and learning how to teach it. >> chemistry and teaching is what i really, really enjoy. >> reporter: this college junior is part of "you teach" a program that helps the next generation be a group of math and science teachers. you have always been interested? they're offering free courses, and do field work at public schools as early as the next semester. after four years, they graduate with a bachelor's degree and teaching certificate. it is no coincidence that the focus is on math and science . >> years ago, if you had a strong back you could get a job. that doesn't exist anymore. >> reporter: the united states will need an estimated 230,000 math and science teachers by 2015 to be competitive in years ahead. >> if you ask where the jobs are, it is in science and math. if you ask where they go to get that? it is great teachers. >> reporter: the teaching begins here at university of texas at austin , 15 years ago, and copied across the country. the math and science initiative helped to establish the program in 34 universities across 16 states. this graduate now teaches high school math. >> if teachers are not passionate about what they're teaching, then the students see that. >> when they get on the table, i just know that something funny is going to happen. makes me want to come to school. >> reporter: back on campus, that is just what these teachers in training hope to hear from their future students. >> i want to you know, show these kids that math is really important and maybe one kid will you know, take that to heart. and then you know, he will be the next albert einstein or newton. >> reporter: helping the students become the best science and math teachers. rehema ellis, nbc news, austin, texas. 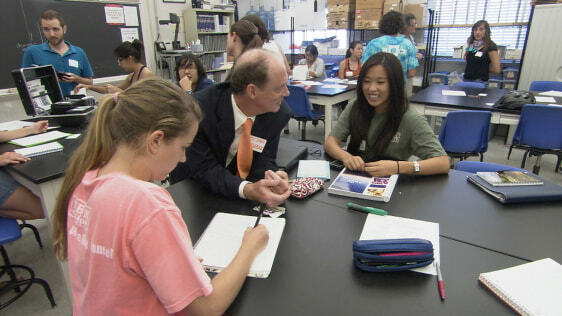 Michael Marder, center, is a physics professor at the University of Texas-Austin who leads the UTeach program. UTeach has has been replicated at more than a dozen universities.